High-tech innovations and introduction of digitalized equipment are likely to influence the growth of archery equipment market in Asia Pacific. A new market research study published by Fact.MR opines increasing number of people indulging in recreational activities and sports will create significant opportunities for archery equipment manufacturers in the region. Growing participation of women in the sports of archery is also likely to augur well for the prospects of the market. Further, dominance of Asian countries such as Korea and China in many international archery competitions is likely to bring much-needed visibility to the sport. The report also opines that archery equipment sales are likely to witness an increase on account of steadily growing adoption of the sport among children. Growing awareness among parents about the cognitive benefits of archery is likely to translate into commercial opportunity for manufacturers. This, the report opines, will contribute to more people taking up the sport, translating into new avenues of growth. According to the market intelligence study, inclusion of archery in Olympics is a positive development for global as well as Asia Pacific archery equipment market. The research study on archery equipment market offers in-depth analysis and insights on various product types. According to Fact.MR’s study on archery equipment market, compound bows remain the top-selling bow type in Asia Pacific. In addition to compound bows, demand is also likely to remain significant for target and 3D arrows as these help the archer to automatically measure the distance range and achieve the perfect shot. Fact.MR’s study foresees a passive growth of traditional arrows due to lack of advanced technology and hunting arrows as hunting is considered an illegal activity in various parts of the region. Archery equipment sales have remained concentrated in direct-to-consumer channel; however, an upsurge in online sales has been witnessed in the recent past. According to the report, easy availability, door-step delivery, and low prices have contributed to the popularity of online sales of archery equipment. The report forecasts that online sales channel will grow at a higher rate vis-à-vis other sales channels. 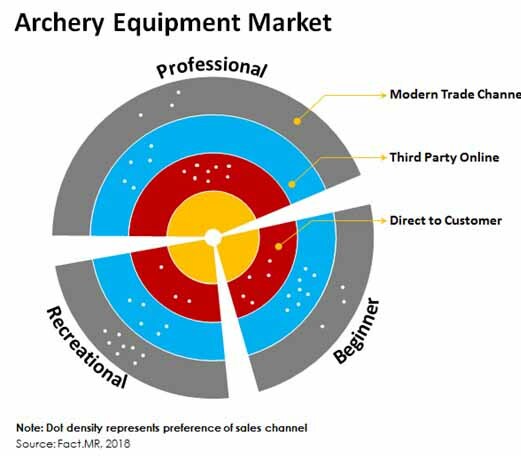 Additionally, independent sports outlet and modern trade channel will continue to complement the growth archery equipment market in Asia Pacific. In addition to offering in-depth analysis on the Asia Pacific archery equipment market, the market intelligence study offers global outlook and forecast on the market. According to the Fact.MR’s study, the global archery equipment market is likely to grow at CAGR of 5.8% during the forecast period. Governments across the globe are including archery in schools, institutional bodies, and fitness clubs which is expected to enhance the demand for bow, arrows, target, and other archery equipment. Realizing the benefits of archery, many training clubs and institutes have also developed across the world which will be highly impactful to the growth of global archery equipment market. Adoption of archery is spreading across key regions of the globe. Global archery equipment market is likely to remain concentrated in North and Europe during the forecast period. These regions have established several organizations and institutes to encourage participation and promote the sport throughout the region. Additionally, easy availability of archery equipment through third part online channel is estimated to boost the market to a greater extent. Fact.MR’s study highlights that incorporating advanced technology and innovative raw material will create lucrative opportunities for manufacturers of archery equipment.